At long last, 2003 and 2004 appear to be the years that the samurai film gets its dues in the West. First we saw that Takeshi Kitano's Zatoichi was a surprise hit both in Japan and around the world, cleaning up at international film festivals. Then the Fall of 2003 brought the releases of Quentin Tarantino's love letter to Japanese chanbara film, Kill Bill: Vol. 1, and Tom Cruise starring in the US produced The Last Samurai. Further bolstering samurai cinema's profile, the awards season saw Yoji Yamada's Twilight Samurai receiving an Oscar nomination for best foreign film and, concurrent with this, there were a slew of samurai cinema DVDs released. Put these facts together and we find that now, more than ever, is the time to be getting into this genre. The samurai is a figure who is based in fact, but embellished in myth, much like the cowboys of the 'old west.' However, unlike their American counterpart, due to the homogenous nature of Japanese culture there persists a social relationship and undercurrent of the samurai which has been maintained and permeates all aspects of Japanese society. Historically, the samurai existed in one form or another from the Nara period in the 7th century. Previous to this, the bushi, or warrior, were primarily derived from aristocracy and played little part in the foundation of Japan. As the power base shifted from the emperor to the aristocracy, the daimyo (provincial lord) began to fight for plots of land. Contiguous with this, retainers - the original meaning of samurai - were hired to execute the lord's wishes, pledging allegiance to the daimyo under whom they were clothed, fed and quartered. As a result their personal identity became intertwined with the lord's and their fealty became dependent on this. In storytelling, legend and art, the samurai was depicted much like the western world's so-called men of myth: the Knights of the Round Table or the Homeric heroes. In scrolls and prints they were depicted as men of chivalry, beautifully dressed and awesomely armored. And whereas the occidental knights followed romantic and noble rules for an honorable life, similarly in Japan, the records show that the samurai lived their life following an unwritten warrior's code, bushido [ 1 ], which governed all of their actions. As Alain Silver describes it in his book The Samurai Film, "The quasi-paradox of possessing a conception of appropriate life-style without the specific organizing principles reflects the complex, century-long process by which bushido evolved: practically, on the field of battle; ideologically, through the guardians of the culture; aesthetically, among the poets and storytellers; and ethically, with the social and religious philosophers." One key attribute of bushido having developed out of the battlefield was the notion that death should be kept close in mind. The essence of this being that if one was not afraid of dying, then each day would be greeted as if it were the last and life would be lived to its fullest. Furthermore, because the warrior code was designed as a moral system, it was never in conflict with itself. However, the three dominant religions and religious theories in Japan were at odds both with each other and also with bushido: Shinto (the animistic religion; 'The Way of the Gods'), Butsudo ('The Way of Buddha'), and Confucianism (the teachings of Confucian thought). Without spending too much time on this, the three religious and philosophical concepts converge at points but are fundamentally at odds with one another, thereby creating eternal philosophical conflicts within the samurai. This is manifested in one key form through the giri versus ninjo paradox and, in fact, is arguably THE dramatic conflict in samurai fiction. Giri, simply, is the honor that the warrior (the samurai in this case) must place to his master. It is his deference for his master that develops both from social expectations within the Japanese society and the behavior that is demanded by his lord, others, and, naturally, bushido. Ninjo, on the other hand, is human will. It is humankind's inclination, instinct and/or natural consciousness and could also be regarded as good judgment. The giri/ninjo conflict could then be described in this manner: if humankind's consciousness is the embodiment of God's moral sense of right and wrong which is placed within the mind, then when giri is at odds with ninjo - such as when one's master demands a battle be fought, but is known to the samurai to be unconscionable - a discord is created within the samurai. Further complicating this pattern, even when giri and ninjo are in agreement, the intrinsic fatalism of Buddhist disbelief in material dealings creates a key conflict. The reason being, if all personal paths and actions in life have been preordained, then there really isn't anything that can be done to forestall the inevitable. Subsequently, as a part of giri, 'the necessary death' becomes an essential part of the way of life. If the situation dictates it, then death might be the most honorable road. Now haunting the ronin there are questions about why he is masterless. Within the bushido, if the samurai were truly noble and dedicated to his master, then when his master died he should have chosen the same path: death. Naturally, there were samurai who chose to become ronin because they found service to their master to be dissatisfying or dishonorable (this features into the giri/ninjo conflict). But within Japanese society, this was unacceptable and therefore the ronin was regarded as a scoundrel and not, at the very least, as a veteran warrior. On a social level, the samurai occupied a sphere where they were answerable primarily to the bushido and little else outside of clan fealty. Once masterless, the ronin's role in society changed dramatically, having no specified purpose anymore. Within Tokugawa society (1603 - 1868), the samurai was empowered to kill a commoner if he felt the situation demanded it. Even if circumstances didn't, the samurai could kill a peasant and only pay a negligible financial penalty. In so far as the ronin were concerned, they were permitted by law to continue wearing two swords (something in Japanese society that only the upper class and the samurai were allowed to do), and in general retain the social perks that came with being a samurai (including the relative lack of accountability for killing a peasant). So in this sense, the ronin would become someone who "slipped between the cracks," so to speak. This is the reason why they were both not respected by the aristocracy and the samurai nobility while also feared by the lower class. Artistically, the ronin was represented in two manners: the noble ronin who comes into town and uses his skills for good, and the corrupt scoundrel who rapes, steals and murders without compunction. The primary setting of the samurai film is during the Tokugawa Shogunate period (1603 - 1868) [ 2 ], although there are a number of films that are set in the late Muromachi (1333 - 1573) and Azuchi-Momoyama (unification) (1573 - 1603) periods. A basic explanation for the large number of Tokugawa era set stories was that the Tokugawa clan ascended to power through the sheer force of their arms. This, as a result, firmly established the importance of the warrior within society, but furthermore, with the new government came numerous strict laws, which necessitated armed government officials for their enforcement. This focus on strong-arm tactics to impose, among other things, a caste system that awarded ruthless war play and mercenary tactics to gain wealth and power, as opposed to relieving famines through food aid, made being a samurai a plum job. The period drama, or the jidai-geki, is one of the staples of Japanese entertainment. These stories are typically short on action but heavy on political intrigue, romantic trysts, and other types of back room engineering; they're stories that are more about characters and less about the sword fighting. It is the jidai-geki drama that is still popularly serialized on Japanese television. The chanbara, or sword fight film, is the action film counterpart to the jidai-geki. Named for the onomatopoetic sound that two (or more) clashing swords make, these films are heavy on action and are, in general, less character-based and more action oriented. Though, it should be noted, they can be character-based as Akira Kurosawa proves in Seven Samurai, Yojimbo, and Sanjuro. 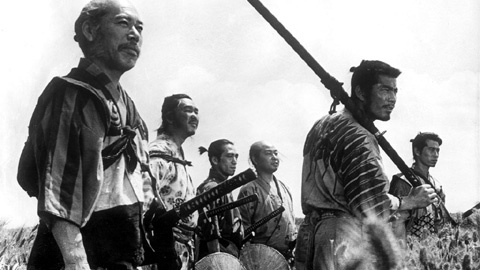 The jidai-geki initially was the dominant form of samurai drama but with the new wave of directors in the 1950s and 1960s, there was a shift in focus towards morally ambiguous and troubled heroes/anti-heroes. With the introduction of the chanbara film the fighting became more stylised and fetishized. An interesting development was that each new film series featured characters that had very specialized skills, styles or even handicaps, and the excitement became for the audience to see how these warriors were going to battle. Some of these formulas became so popular that they spawned massive series and spin-offs, of which the Zatoichi (Blind Swordsman) series is still the best example. Furthermore, as with all art, by veiling these films as period dramas and simple sword fight movies, it was possible to disguise their political criticism and lampooning of the government. Often times, the films were cynical indictments of the Japanese feudal system (emperor and all) and of the over reliance on honor and the group over the individual. Specifically, films like Masaki Kobayashi's Harakiri (1967) are critical of the over-value placed on bushido and the samurai's loyalty to the clan being more significant than life itself. The critique reads that all lives and their deaths that occur in an impersonal and pointless social order become, inexorably, impersonal and pointless as well. The reward for following the rules or rebelling against them is ultimately the same: identical destruction. The samurai is always found with the same few items: two swords, samurai clothing emblazoned with his master's signet, and a chonmage (top knot). (The chonmage, itself, was a haircut designed for battle helmets.) While it later developed into a defining aspect of a samurai's look, they did not always sport it. These attributes were so specific and unique to the samurai and were therefore so socially ingrained into the Japanese culture that it became possible, in films, to shortcut clumsy exposition and introduce a character as a samurai simply and efficiently by showing them with these items. Akira Kurosawa introduces Yojimbo in such a manner by focusing on the master's signet on Sanjuro's robe, his chonmage haircut, and then, finally, revealing his two swords on his hip as the framing changes to show his full body. For a Japanese audience member this was illustrative enough. When it is then revealed that Sanjuro is wandering by himself, letting the winds of fate blow him around, we learn that he is, in fact, a mawari ronin (a wandering masterless samurai). This, then, becomes all of the information that we need to get the story started. Another aspect of the samurai film, as mentioned previously, is the political intrigue and double-crossing that feeds into the daimyo's power struggles. In these stories, the samurai is the weapon of choice, though, depending on the character of the lord and his dedication to his retainer, or vice-versa, the relationship could be dissolved if the situation demanded it. Within the jidai-geki and chanbara film where giri and ninjo are so highly praised, in a sense it is ironic to see that these attributes can be put aside (if need be), for a higher political aim. But such is the nature of the beast. The result within these films, though, is that double and triple crosses inevitably lead to violence. Violence, although often used in the films in a consistent manner to the world where it is set, with the rise of the more pessimistic chanbara film, the carnage took on a stylized approach that represented the existential state of the world that the samurai operated in. This came to represent their desire to fight against the hypocrisy by "
delineating their oppressed relationship to that environment" through bloodshed. Though by all means this is not meant to be an exhaustive list of genre types, here are a few staples of the genre. There is the 'lone wolf' film with the loner samurai as the protagonist. The group samurai film, where no one samurai is singled out, but instead the group acts as 'one large samurai.' Then there is the revenge story, a genre staple, which most directly demonstrates the honorability of the samurai, by showing his dedication to his master or cause, oftentimes to the exclusion of his own life. The whole notion of vengeance is, in a real sense, sanctioned by Japanese society and one will find that a number of the jidai-geki and chanbara film use this theme, if not as a main story element, then certainly in a sub-plot. Vengeance is often romanticized and visualized in a 'poetic' manner; needless to say, melodrama can run thick at times. Wrapping up the short list, and this is primarily due to the central role that the samurai Musashi Miyamoto plays in Japanese folklore, is the 'rise to excellence' storyline. In these stories, the character starts out a bumbling fool and ends with great sword skill and an enlightened insight into the human condition. This, perhaps, can be called the Japanese version of the 'hero journey'. There are certain technical, metaphoric and literary tropes that are readily found in samurai cinema. Again, this is not a full list by any means, but represents certain constants in the genre. In general, the chanbara film, technically speaking, is more complicated than the jidai-geki film. The following list includes technical attributes that do occur in both jidai-geki and chanbara, but are more prevalent in the chanbara movie. These include: hyper real sound effects, dynamic (and funky) musical scores, inter-titles, lens flares, slow/fast motion, whip pans and snap zooms, special optical effects, wide aspect ratios [ 3 ], and color (once color film became standard) [ 4 ]. The metaphoric elements include: the excessive use of wind, rain, snow, fire, blood, bright/dim lighting, and shadows, to name a few. It goes without saying that these elements are used in these films, certainly by contemporary standards, in some very ham-fisted manners. As a result, these elements feel theatrical, but nonetheless, help to create a very unique and exciting viewing experience. Essentially all of the literary tropes of the genre have been covered in some portion previously but are listed here in a brief, and by no means complete, list. The stories can be about giri or about the giri/ninjo conflict. The stories are often about a ronin, who is either noble or corrupt [ 5 ]. And the stories can, of course, be about revenge. This type of story, by-and-large, ends in a showdown of some type: typically between our protagonist and a swordsman of (near) equal talent. The battle is usually glorious and often features a geyser of blood [ 6 ]. and the more you want to watch. And with that, I say, "Enjoy!" [ 1 ]: Seventeenth-century sage Soko Yamago, it is believed, coined the term 'bushido'. [ 2 ]: More commonly known as the Edo period due to the fact that Japan's capital was based in Edo (modern-day Tokyo). [ 3 ]: Also known as the 'scope' film. This use of extremely wide aspect ratios serves numerous purposes. By contextualizing the film in a classic screen-print manner, it subconsciously places the viewer. In the same way that old ink prints and scrolls were designed to encapsulate the viewer into the scene, the 'scope' film was designed to draw you in. It also helped to add a sense of grandeur to the samurai film. [ 4 ]: At the end of the so-called samurai film hey-day, the use of color was de rigueur and was as important as wide aspect ratios in identifying the films to the genre. [ 5 ]: Specifically, this manifests as the ronin who rolls into town and helps the local people out of their problem. Or, on the contrary, it is the ronin who kills and pillages with no compunction. [ 6 ]: The meaning of which, naturally, is open to a large amount of interpretation.